Using both familiar carols and fun, new songs, Out Standing in Their Field tells the Christmas story with a ragtag group of shepherds and a colorful company of angels. This 20-minute musical is easily prepared and presented, and flows with clever dialogue while ending with a powerful message. 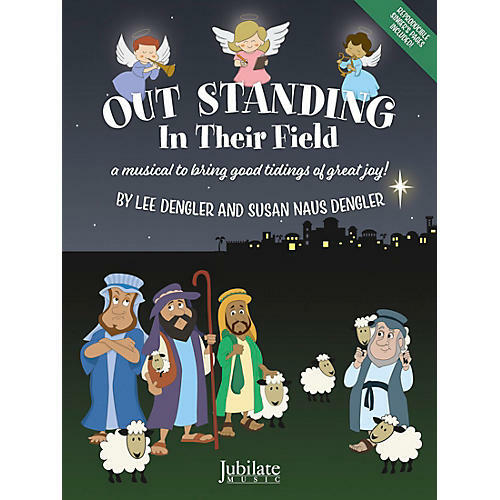 Meet Clarence, the concerned angel, Gabriel, the “cool” trumpet-playing angel, Oscar, the grouchy shepherd, Missy, the exuberant shepherd-in-training and more as they find their way to the manger…while learning that with the birth of Jesus, everyone is truly outstanding! As an added bonus, the CD contained in the Director's Kit contains instrumental parts (Flute, Clarinet, Percussion, and Cello) for those churches who choose not to use the accompaniment track.